Known broadly for the "2-and-20" model, hedge funds quote headline fees. These fees include both a management fee and performance (or incentive) fee. As the hedge fund industry has grown, poorer relative performance and increased competition have created substantial pressure on headline fees. In certain areas, such as '40 Act liquid alternatives, there has also been a push for a management-fee-only, or flat fee model. Nevertheless, performance fees are still relatively common for hedge funds. Performance fees are somewhat more complex than flat fees, as they require a manager to define "performance." As a result, behind headline performance fees there are payment terms related to the calculation and frequency of fee payments. The frequency of performance fee payment is often called by the fancy name "fee crystallization frequency." It describes how often managers get to "crystallize" fees. Put simply, this is how often fund managers can get paid for performance, whether it's daily, monthly, quarterly, semiannually or annually. As we all learned in Finance 101, more frequent compounding increases the total amount of interest paid. For hedge funds the same concept applies. The more frequent the marking of performance, the higher the potential for fees to be paid. From this perspective, given the same headline fees, on average, the more frequent the crystallization, the higher the total fee paid to the hedge fund manager. All other things equal, a manager might prefer to mark performance more often instead of seldom. Does the timing and frequency of performance fees payments matter? Absolutely. Let's consider a hypothetical Fund XYZ. Assume that Fund XYZ charges "zero and 20" or no management fee and a 20% performance fee and has a high water mark of 110. The fund has stellar performance in year one and until the second quarter of year two, after which it gives back a large portion of prior gains. 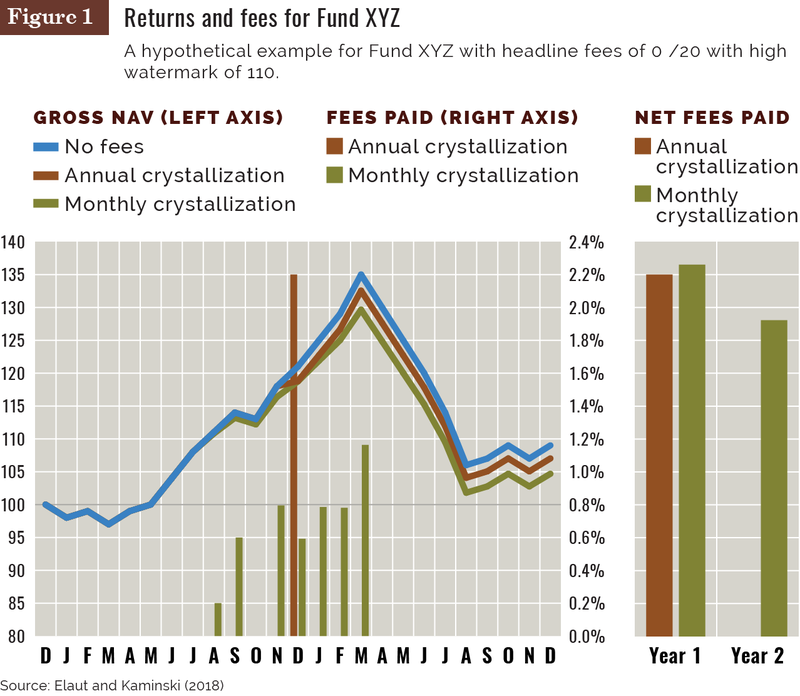 For both monthly and annual performance fee crystallization, Figure 1 plots the gross return and net return, as well as the net fees paid for Fund XYZ during this two-year period. For the first year, the investor would pay roughly 2% net regardless of the payment frequency. In year two, the investor would pay no fees with annual payments and 182 basis points with monthly payments. What investor would like to pay 1.8% in fees in a 10% down year? Note, for the same structure, the actual fee loads are very different: zero or 182 bps. 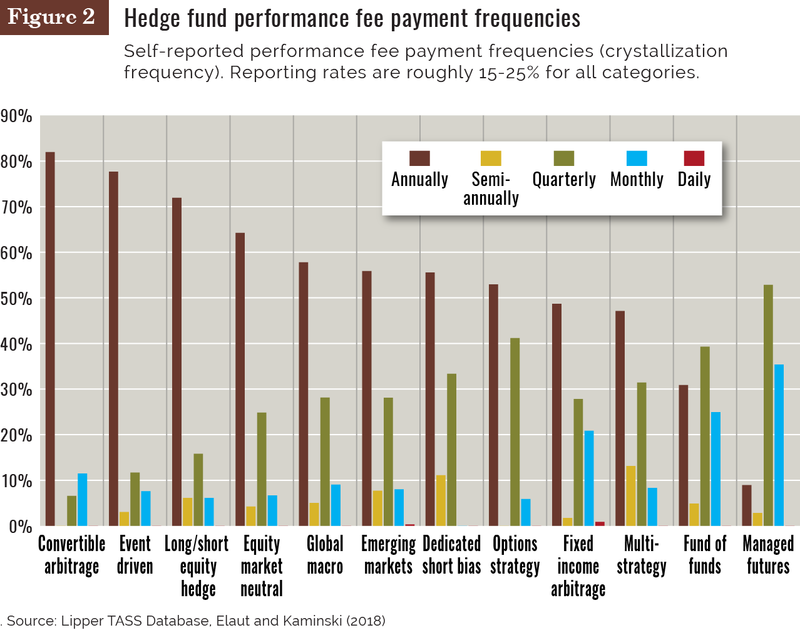 Do hedge funds actually crystallize fees more often than annually? The answer is yes. In a recent research paper, we examined the hidden costs of performance fee payment frequencies. We found substantial variation across the industry with a few thematic trends. Figure 2 plots the reported hedge fund fee crystallization frequencies. First, as one might expect, less liquid strategies like convertible arbitrage and event driven often use annual fee crystallization while more liquid, multistrategy and higher volatility strategies like managed futures and funds of funds have tended to prefer more frequent fee crystallization. Since headline fees include both performance and management fees, it could be possible that a lower management fee offsets the higher rate of fee crystallization. Unfortunately that's not the case; we found funds with more frequent fee crystallization had higher management fees as well! This was surprising, but it shows that the amount of fees paid and how they are paid vary somewhat across the hedge fund universe. It appears even for similar headline fees an investor could be paying very different fee load even in the same fund category. What is the potential cost for an investor? We present a model for estimating the hidden costs of frequent fee crystallization based on the management fee, the performance fee and the strategy volatility. Figure 3 plots the estimated hidden costs of moving to a more frequent performance fee payment model. The fee impact can range from 8 basis points to 78 basis points for a 10% volatility fund and 18 basis points to 155 basis points for a 20% volatility fund depending on the frequency and time horizon. For example, given a 20% volatility fund charging 2% and 20%, the average additional cost of daily fee crystallization is 155 basis points if the investment is held for only one year, 78 basis points a year for three years and 59 basis points a year for five years. Hedge fund fees are important to investors, especially as there is increased scrutiny and pressure on these fees. Our research further demonstrates the need for investors to look behind headline fees to understand the actual fees they could be paying. 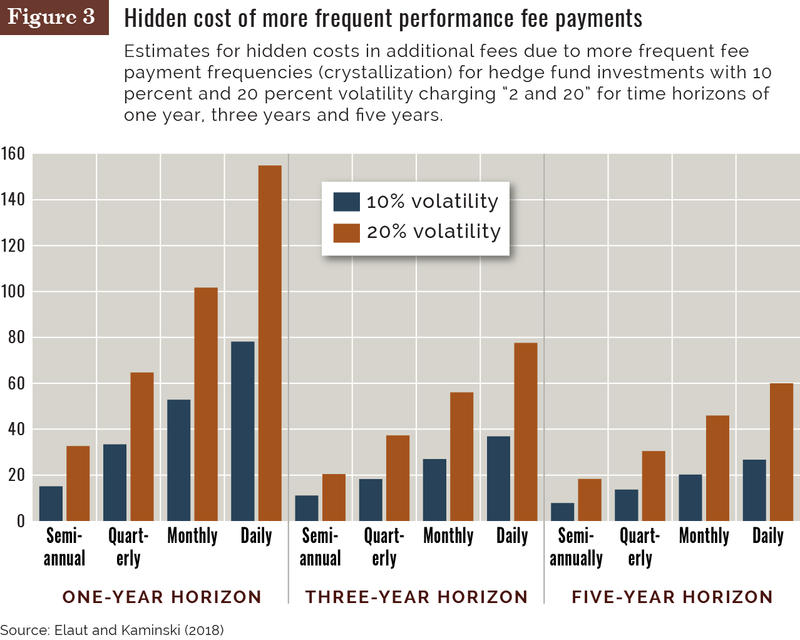 More frequent payment of performance fees can lead to higher costs especially for higher volatility investments and shorter investment horizons. Investors should consider this possibility carefully when negotiating with managers and when accessing the fees paid for their fund investments. Gert Elaut is a quantitative equity fund manager at KBC Asset Management, Brussels, and an affiliated researcher at Ghent University, Ghent, Belgium. Kathryn Kaminski is a visiting scientist at the MIT Laboratory for Financial Engineering, Cambridge, Mass. This content represents the views of the authors. It was submitted and edited under P&I guidelines, but is not a product of P&I's editorial team.